Nicole Blaje and I rapidly became friends soon after I started my blog. I used to drop into Cynthia Rowley on Damen Avenue during the winter to warm up during snowy street-style hunts in Bucktown. We’ve spent hours chatting about everything from 90s pop culture to fashion blogs (duh) and runway collections to deeper issues of social class and politics. Basically, Nicole is my intellectual fashion soulmate. Like me, she’s also a grad student in a master’s program at Loyola. 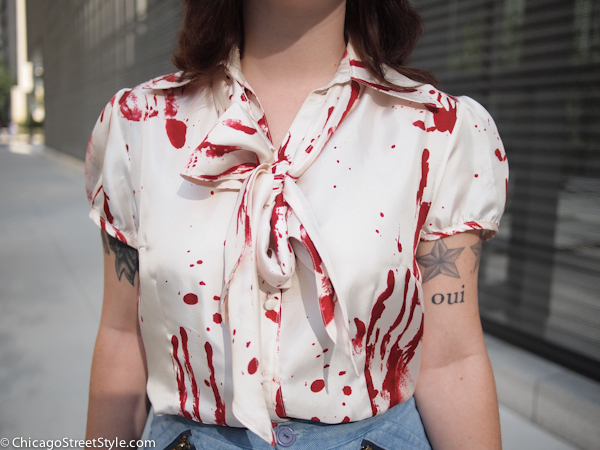 Besides, only the coolest person in the world would rock this Libertine silk top dyed to look like it’s covered in bloodstains. Nicole told me she found it on Yoox, steeply discounted, and it was one of the greatest finds of her internet fashion shopping career. Like me, she’s a crafty bargain hunter when it comes to fulfilling her designer clothing cravings! I absolutely need these pants! The 70's are hitting big this fall – and I love it! Great find Amy! PS keep up with the personal style posts! Super intriguing and you look fab. I want those sunglasses you wore! love her blouse, looks like a good diy!